While rare, the description of the standard labor relationship as a human rental is not new. Here’s what a few well known economists have said. Paul Samuelson in Economics 1976 (10th edition). Here is the image of the relevant part of that page. And here is the direct image. The inability to capitalize labor is not strictly correct. 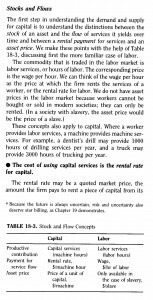 The “marvel” of modern finance is that labor is capitalized whenever businesses are sold for more than their net asset value (for example a publicly traded firm whose market value is greater than its net asset value). The value of a firm in excess of its net asset value represents the capitalized value of the labor of future employees. It is the prearranged theft of the profits of future workers. A similar scheme in the past may have involved trading shares of a slave owning firm, a deceptive way to deprive slaves of their inalienable rights by packaging the transaction as the sale of a firm in a free market. It is an old trick with continued application. James Mill in Elements of Political Economy 1844. The labourer, who receives wages, sells his labour for a day, a week, a month, a year, as the case may be. The manufacturer, who pays these wages, buys the labour, for the day, the year, or whatever period it may be. He is equally well the owner of labour, with the manufacturer who operates with slaves. The only difference is, in the mode of purchasing. The owner of the slave purchases, at once, the whole of the labour, which the man can ever perform: he, who pays wages, purchase only so much of a man’s labour as he can perform in a day, or any other stipulated time. Being equally, however, the owner of the labour, so purchased, as the owner of the slave is that of the slave, the produce, which is the result of this labour, combined with his capital, is all equally his own. In the state of society, in which we at present exist, it is in these circumstance that almost all production is effected: the capitalist is the owner of both instruments of production: and the whole of the product is his. Fischer, Dornbusch, and Schmalensee in Economics 1988. Fischer, Dornbusch, and Schmalensee included a useful table. One of the small but rewarding vocations of a free society is the provision of needed conclusions, properly supported by statistics and moral indignation, for those in a position to pay. A perceptive comment which certainly applies to the economic establishment, and to which volumes of literature attest. Why question something as fundamental as the validity of human rentals, when the foundation of the entire framework is at stake. The “beauty” of an institutionalized fraud like the employment contract is that there is no de facto transfer that fulfills the contract. The pseudotransfer of labor (i.e., voluntary co-operation with the employer) has been accepted for centuries by the legal authorities themselves as fulfilling the contract. The “discovery” of the fraud thus requires extensive analysis to see that labor is not de facto transferable after all. And any responsible scholar and respected businessperson–being embedded in the institutions of the employment system–has every incentive not to make that discovery.